Transformers The Last Knight just kind of came and went. No, I didn’t see it, and I honestly doubt if I ever will. I hope that “Bumblebee” will be better due to Travis Knight’s involvement but you never know. The Dinobots, as I’ve heard, don’t play a very big role in The Last Knight, but honestly I don’t think Age of Extinction handled them very well to begin with, so I can’t be too disappointed at their lack of involvement”. In terms of action figures however, I quite liked most of Age of Extinction’s Dinobots, (except slash, and yes I haven’t actually touched that figure since my review of it.) 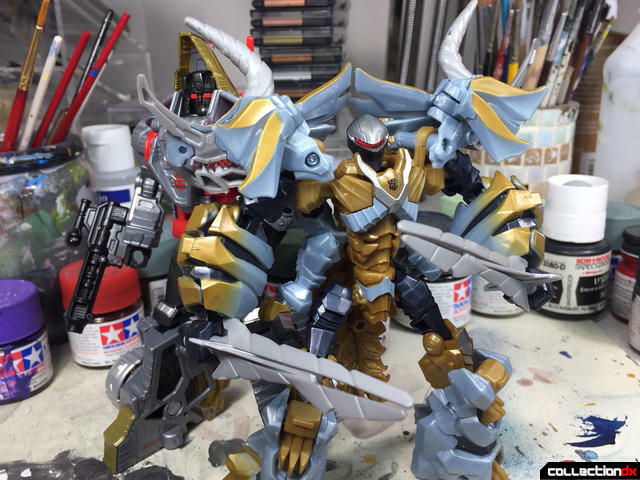 so getting some repaints of them excited me somewhat. 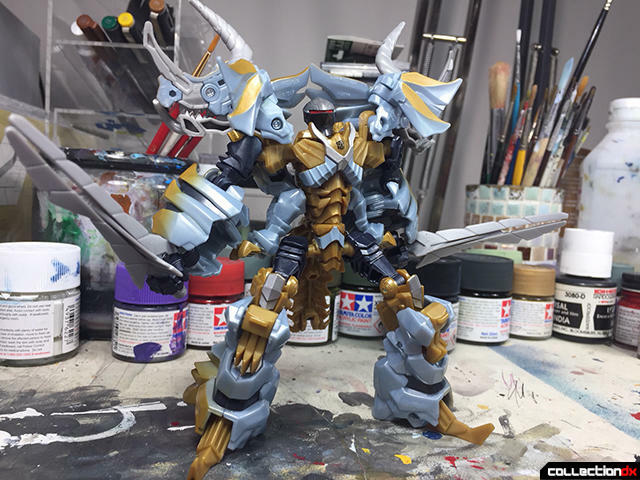 I especially liked the Deluxe class Age of Extinction Slug, (or slag) and in this review, I hope to show you the third way a repaint can go. 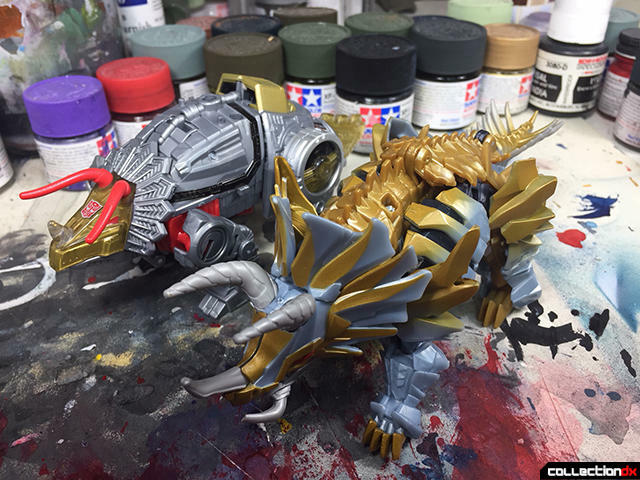 In the past, I’ve shown that repainting can improve a mold, as it did for Quake, and how it can degrade one, as Breakaway can attest too. 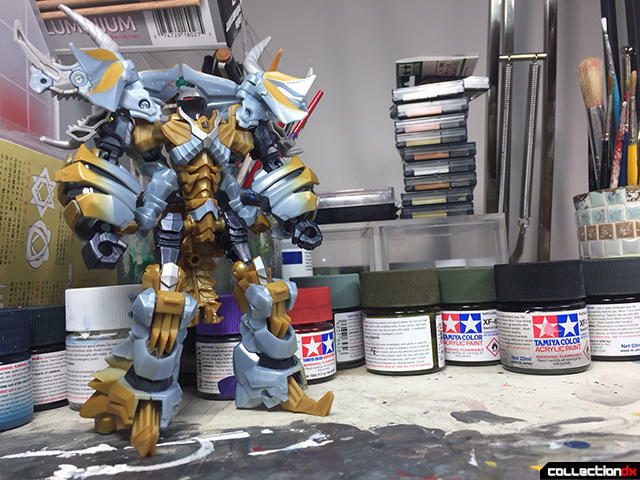 What I haven’t covered yet, is how a repaint can make a figure just as good as the original; nothing more and nothing less. 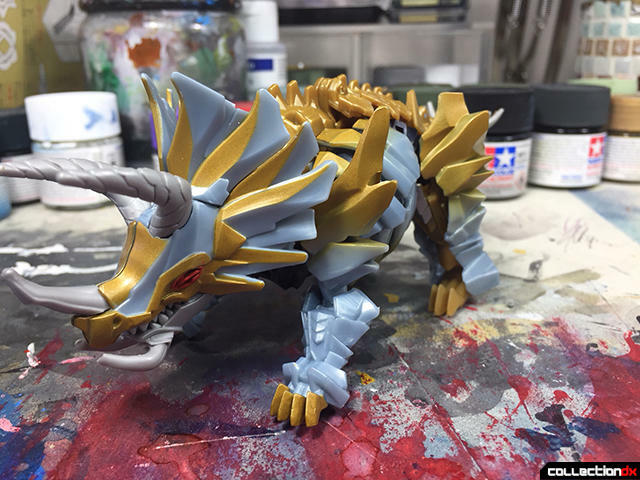 In Triceratops mode, Slug looks really good. 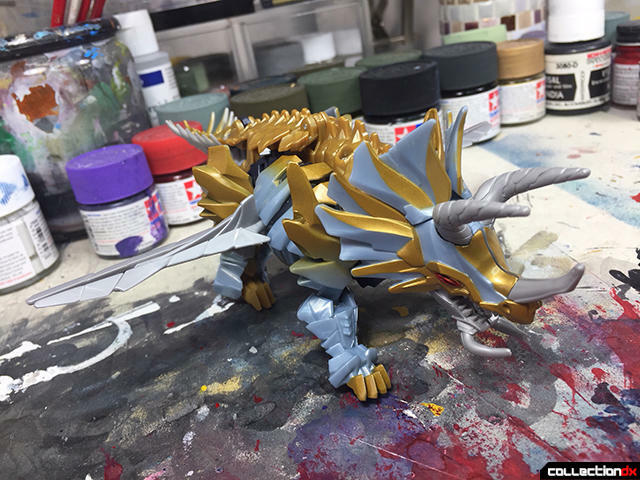 The actual beast mode design itself is really dense and powerful looking, with it’s overall solidity and multitude of spikes, some but not all of which, are rendered in a flexible pvc material. 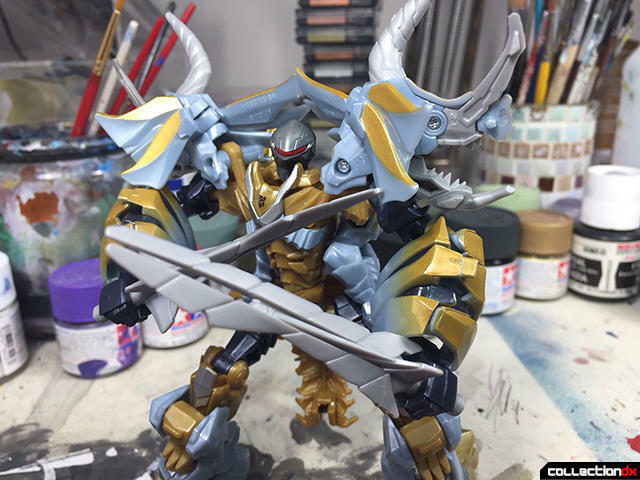 The color scheme is, in my opinion, just as good as the “aoe” version, because while it does carry the whole Knight aesthetic a little better, it lacks some of the eye catching personality of it’s predecessor. Slug’s dual swords play a big part in Beast mode, as well as in his robot mode. For now, both weapons can plug into the Triceratops’s flanks, which is cool, but they don’t like to stay very well. 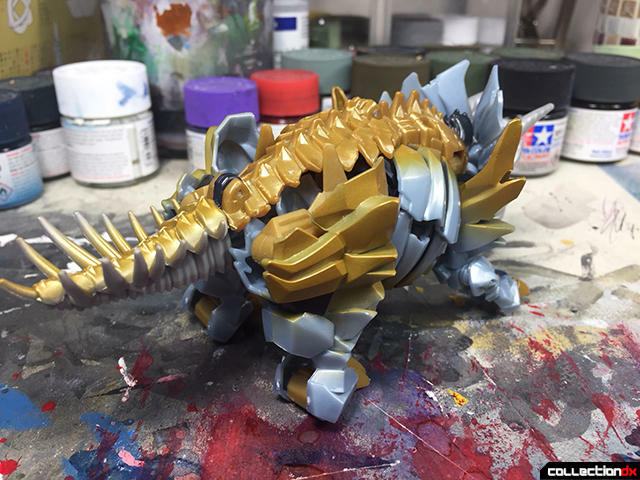 Taking zero cues from a certain Japanese Beast Wars Predacon Triceratops, Slug handles his transformation to robot mode with no shell forming, but very little grace, as parts constantly get in the way of each other. That being said, the ideas present here are pretty inventive. I especially like how the stomach sections of the beast mode fold up into the robot’s arms. Another big positive is that the robot mode could not look any different from where it started, which is highly appreciated. In robot mode, Slug just looks awesome, and there are few other ways for me to describe it. 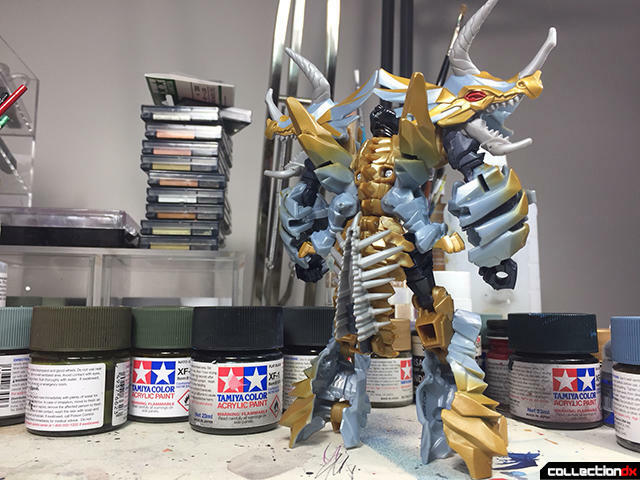 He’s as if a Knight from Dark Souls became a Transformer, and wow, am I happy about that. From his head sculpt to his ridiculously aggressive shoulders and feet, Slug looks like he could strike fear into the spark of anyone, Autobot or Decepticon. As a figure, this mode is a little fiddly, but if you just bare with it, you’ll have fun. Once you incorporate his two huge swords, Slug looks even better, but sadly, his arm articulation is a little restricted due to how overly aggressive the designers made him look. I didn’t mean that to sound like a bad thing, however. Overall, Transformers: The Last Knight Premier Edition Deluxe Class Autobot Slug is a pretty fine figure that although stumbles a little in terms of actual ease of use, makes up for it considerably in terms of his uncompromising style, and awesome design in both modes. If the purple of the original Age of Extinction Slug rubbed you the wrong way, and any other version of him is just too expensive for you, then I would definitely recommend the Last Knight one. On sale that is, because no matter how cool it looks, paying $20 for a repaint of a $15 figure is asking too much.